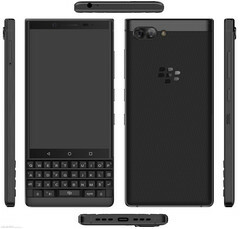 Images of BlackBerry’s Athena phone have surfaced online, via the State Intellectual Property Office of the People’s Republic of China (SIPO). The device has a good-looking mechanical QWERTY keyboard beneath a large screen, and it offers dual-camera functionality on its rear. The Athena is expected to be the successor to 2017’s BlackBerry KEYone. Renders of a new BlackBerry device called the Athena have appeared on the SlashLeaks website (via the Chinese patent office, SIPO). The images show the phone in considerable detail and from all angles, but no specifications are given in regard to components. The Athena has a seemingly large screen with a physical QWERTY keyboard beneath it. The front-facing camera is placed on the top bezel, while the device’s rear shows dual camera sensors next to the LED flash. Connectivity on the bottom edge includes a USB Type-C port with speaker grilles on either side, while the top edge has a 3.5 mm audio jack. The left side of the device sports the SIM tray and the right side has the volume rocker, power button, and a ridged convenience key that can be configured to a specific action. The textured back cover should provide the user with additional grip when holding the smartphone. The initial impression the BlackBerry Athena gives is that it is aesthetically pleasing, and hopefully the phone will achieve a better score than the KEYone device managed when reviewed by Notebookcheck last year. Unfortunately, there are no details in regard to release date or potential retail price at the moment.